Best Time of Year for Rogue River Trips? Great question! 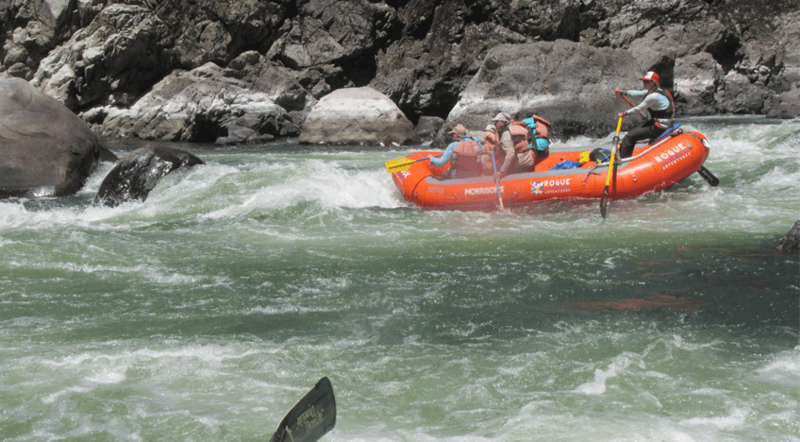 Morrisons Rogue Wilderness Adventures (MRWA) offers a large range of amazing Rogue River Trips and when you schedule your trip, it depends on what you’re thinking about doing. Rafting, hiking, and fishing all have different times of year that they shine, so we put together a list of considerations for each trip MRWA offers. May and September tend to have a larger percentage of rainfall, and cooler temperatures. But with school in session, you are likely to get the river all to yourself. June is the change in season to full time summer weather, and is usually your best bet if you’re looking for a sunny day that’s not too hot. July and August tend to be drier and hotter with average daytime temperatures of 90 degrees. In those months, a sunny day and cool refreshing water temps combine to create perfect Rogue River trips. The nights on the river are always cool though, make sure you bring some warm clothes if you will be out overnight! The level of the river tends to be higher in the spring (May/June) and fall (September). Higher water means bigger splashes and cooler water temps. So if you’re looking for a splashier, more thrilling ride, those months are for you. On the other hand, July and August have warmer water temps and slightly lower flows. Don’t worry though, the rapids on Rogue River trips are still a great time and the water temp is plenty cool and refreshing. During the summer season, our traffic tends to be busiest Saturday-Mondays. We have plenty of room, but if you are looking for a smaller trip, mid-week will be better for you. Also, holidays and three day weekends are some of the busiest times at the river. Fourth of July weekend is usually our busiest weekend of the summer. We recommend avoiding those busy weekends if you don’t like crowds. Hiking the other hand, is a very different story. The river is not as much of a factor when considering your timing, but escaping the hot summer blaze absolutely is. We offer hiking trips starting in early May through mid-June, and again starting in September through mid-October. These are the months with great hiking weather. So the first question you need to ask yourself is…. Both trips can be cool in May and June days can be around 55°-80° and nights 50°-60°. September trips generally have mild days (60°-80°) and cool nights (50°-60°). Both have the possibility of rain storms, but hiking on a cool rainy day in the spring and fall is fantastic. We have the luxury of heading to lodges while we hike, so drying out is not a problem. Ends of the season: The weather tends to be colder and rainier closer to the ends of the season(early May and October), and hotter and drier closer to the middle of the summer(June-August). Note that the temps on the trail tend to be about 10 degrees hotter than below on the river. We recommend aiming for the cooler temperatures. The fish run upstream when the water is cool and high. Here on the Rogue, we are lucky enough to have a reservoir upstream designated almost exclusively to facilitate the habitat of fish. Although fishing is available on the Rogue all year, the world famous Salmon and Steelhead Trout runs happen in the fall when water is released from the reservoir. The Salmon run can be as early as September 1, and goes well into October. Steelhead tend to start their run a little later, usually in October. There are variations from season to season, so check with our experts at RWA (1.800.366.1647) to ensure your best chances! While considering your options, don’t forget to check out our ‘Wishing’ and ‘Wiking’ Trips where we bring our wine expert and our prized Southern Oregon wine. So there you have it, a few great things to keep in mind while considering the timing of your Rogue River Vacation. No matter what time of year you want to come, we have a trip available for you. If you have more questions regarding specific flows and weather patterns, feel free to give our friendly staff a call at 1.800.366.1647. We can’t wait to begin your next adventure with the MRWA family!